04 Oct Are you sitting comfortably? For event organisers, one of the key things to avoid at events are bottlenecks. Whether at the registration desk, at the entrance to the plenary sessions, at breaks and lunches, or getting on and off transport, bottlenecks are a guaranteed way to make delegates disgruntled. A lot of thought, site visits and planning goes into ensuring the flow of people at the event will be manageable. Any new tools that can help in this can become incredibly useful, and we at Group Dynamics are constantly striving to give our clients new and innovative solutions to make their events more successful. We have been using Smart Badges using NFC (Near Field Communication) technology for several years now with our Messenger handsets and now our Smart tablets and Smart kiosks for both delegate registration and attendance management. 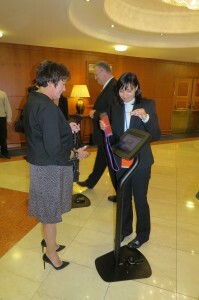 Our new solutions however, now enable delegates to discover information for themselves and to reduce bottlenecks. One of the areas that often causes issues revolves around getting all delegates to the right places at the right times. This includes getting them to the right room or session, but often also involves getting them to their specific table in the right room. When you have organised the seating for 500 people, telling them which table they are on and where that table is located can be difficult, and not to mention challenging. Large posters cannot avoid the few moments it takes each delegate to locate their table and then the route to it, leading to the dreaded bottleneck. Our innovative Smart Table solution dispenses with all that paper and speeds up the whole process. Through the use of the delegates’ Smart Badges, we can instantly show them which table they are on and highlight it so that the process is fast, smooth and efficient. And if suddenly you have to add a table five minutes before the event starts, then the system can handle that too. At a recent event for a large accountancy firm, we provided Smart Badges for their 500 conference delegates. Not only was getting the delegates to the right tables a potential cause for concern for the organisers, but there were also an additional 15 break out sessions to organise. To solve this problem, our Smart Kiosks were used at the entrances to the plenary session to inform delegates of where they were seated, and they also informed them of the break out sessions. On each table we provided another Smart tablet to facilitate messaging. With a simple swipe of their badge onto their tablet, delegates were identified and messages labelled accordingly. Additionally, we also provided the break out information on these tablets so that guests were reminded at every instance of where they were to go next. The result was (almost!) a self-running event with delegates flowing smoothly into the plenary and then to their respective break out sessions. Delays were eliminated which helped the overall timings of the event and delegates really appreciated having their personalised event information at their fingertips. For more information, please do give us a call and we’d be more than happy to discuss how we can assist you at your next event.